As simple as it might sound, this roll is actually my favorite roll out of all the rolls I have made thus far! UPDATE: Check out the Spicy Tuna Salad Roll! We used Tanit’s suggestion, and it’s yummy! Open the tuna cans carefully, and drain. Mix the tuna with mayonnaise, mustard, and anything else you like putting in your tuna salad, to taste. Roll the sushi. 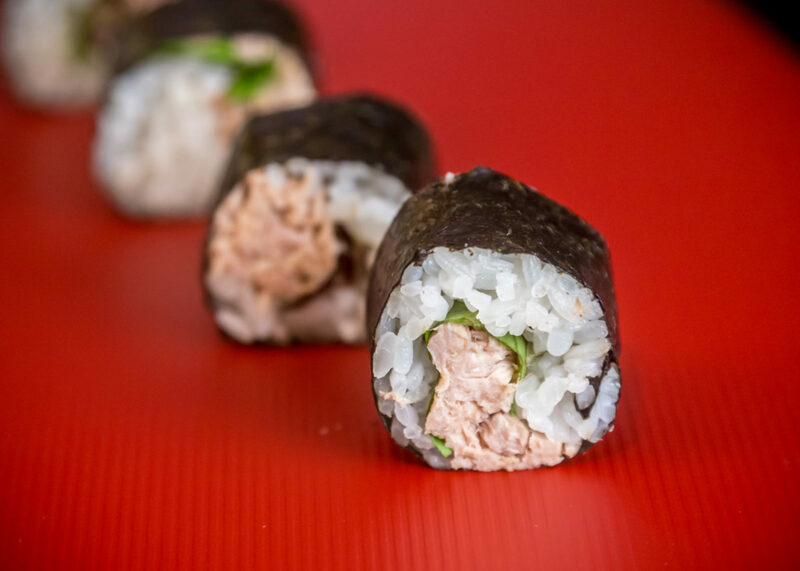 For your fillings, place a couple of lettuce leaves on the sumeshi-covered nori and place about half a can of tuna salad- then roll the sushi as you normally would. Mm, so I wonder how it would taste to just mix tuna salad with rice, lol. (Yes. Yes, I am very lazy. Nod again.) Haha my bf is a very picky eater but surprisingly loves tuna salad (he swears he hates fish, but he’ll eat eel, sometimes he’ll eat raw fish- if he sees me LOVING it and ignoring him, hahaha- he’s so funny like that) so I think I could get him to eat this. Mmm. BTW, my friends and I have talked about throwing a sushi making party and when we do, I am definitely using your site for recipes and how-to’s. (And of course, I’ll take & post pictures, crediting you for recipes!) Mmmm! Thanks! I am trying it tomorrow! Cool Site! My friends love this Tuna Salad Sushi’s. Instead of the lettuce i put omelet inside. Also very tasty. Oooo that sounds good too! I may have to try that sometime soon! Yummy…. cool recipe! ill definitly try this one! also I tried making deviled egg rolls! they were great! haha! I have a Japanese-Vietnamese friend who makes rolls like this one all the time! She uses canned tuna (with a little mayo), imitation crab, cucumber, avocado, and sometimes scrambled eggs. It’s DELICIOUS, and perfect for a midday snack, not to mention extremely easy and cheap! Greek yogurt is a good substitute for those who don’t mayonnaise. Samantha – That sounds delicious, with all the extra ingredients! I’ll have to try that sometime. Thanks! Samantha – That’s a fantastic idea. We use Sriracha to spice up our tuna salad sometimes, but I’m sure wasabi would give it a nice little kick as well. Thanks!